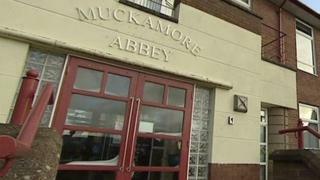 Four staff members have been suspended from Muckamore Abbey Hospital in Antrim while police conduct an investigation. The BBC understands that the investigation centres around the care of at least two patients. Muckamore Abbey Hospital provides acute inpatient care to adults with an intellectual disability, behavioural or mental health problems. A spokesperson for the Belfast Health Trust said that an incident had come to light several months ago. “Following concerns identified in relation to the conduct of a small number of staff in Muckamore Abbey Hospital, Belfast Trust has placed four members of staff on precautionary exclusion from work while a full internal investigation is undertaken,” it said. Families of other residents are being kept informed of the investigation. The Belfast trust says it has introduced additional measures and is assured of the ongoing safety and care of the community of patients in the hospital.